TONGE, Thomas : of Gunthorpe, Owsteon, Co. Lincoln. Will 1659. Abstract in contained in the William Asheton Tonge papers at Chetham Library. The 15th day of June 1659. I, THOMAS TONGE of Gunthorpe in the parish of Owston in the Isle of Axholme in Co. Lincoln, husbandman. To be buried in the parish Churchyard of Misterton. To my son Thomas Tonge and his heirs for ever 4 acres of arable land in Misterton field, after the decease of myself and my wife; also £6 that he owes me. To his daughter Ann Tonge one "Quie Calfe". To my daughter Elizabeth Tonge half of my building place with a ground adjacent wherein I now dwell, and 1 a. of meadow in Gunthorpe Ings; to her and her heirs for ever. 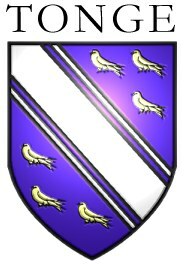 To my daughter Sarah the other half of my building place and ground, and 2 selions of land in Gunthorpe field called Ward lands; he her and her heirs for ever. To my daughter Elizabeth 1 grey mare and one foal. To my daughter Sarah, one filly and one brown horse called Byard. To my daughter Rosamond and her son Thomas Waterland one mare, & c.
To my son-in-law Thomas Waterland as much wood as will make him one "plow". To my daughter Mary Dickenson one 2 years old "Quie." To her two daughters Mary and Sarah 20s. each. The rest of my goods to Hellen my wife and to Elizabeth and Sarah my daughters, who I make executors. Witnesses: Henry Newton, Richard Maskell.